China and Russia are underscoring their military partnership by holding a joint naval exercise in the South China Sea (SCS), following a ruling by an international tribunal at The Hague, which did not go in Beijing’s favour. Some analysts say the exercise is a confirmation of the growing strategic partnership between Beijing and Moscow. “The strategic relationship between the two countries is already an established reality. Already the two countries are demonstrating their military clout. Last August, Russia and China carried out military exercises in the Peter the Great Gulf, south of the Russian Pacific city of Vladivostok. A few months earlier, they had conducted their first joint naval exercises in European waters in the Black Sea and Mediterranean. The upcoming show of strength by Moscow and Beijing follows the ruling by a tribunal, established by the Permanent Court of Arbitration (PCA), at the unilateral request of the Philippines. The panel rejected the legality of China’s claims to the nine-dash demarcation line, which encompasses most of the waters of the SCS. China, on its part has trashed the ruling as “null and void”. Colonel Yang did not specify the size or location of the exercise in the SCS. There is speculation in the Chinese media that the exercise could consider use of the disputed Woody Island (YonxingIsland as called by China) in the Paracel (Xisha) island chain, but not the Spratly islands, which have drawn sharper global attention. 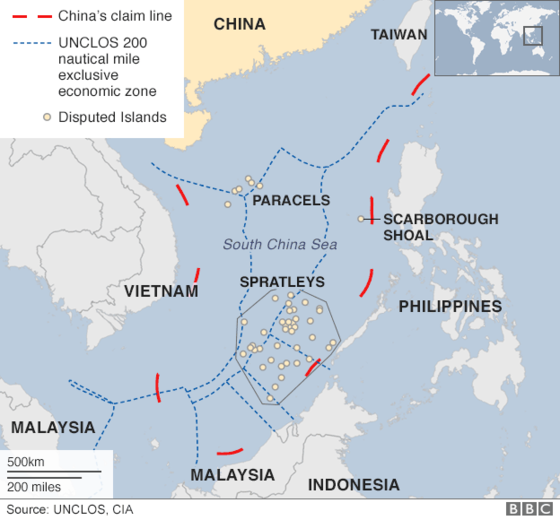 China, Vietnam, the Philippines, Taiwan, Malaysia and Brunei all have competing claims.China has backed its expansive claims with island-building and naval patrols. The US says it does not take sides in territorial disputes, but has sent military ships and planes near disputed islands, calling them “freedom of navigation” operations to ensure access to key shipping and air routes. Both sides have accused each other of “militarising” the South China Sea.There are fears that the area is becoming a flashpoint, with potentially serious global consequences. It is also not clear whether China claims only land territory within the nine-dash line or all the territorial waters within the line as well. While India isn’t party to the South China Sea dispute, four aspects of the recent developments might interest New Delhi. First, irrespective of the claims and counter-claims by the United States and China, it is clear that Beijing operates from a position of strength in the South China Sea, wherein it has physical control over critical islands in the region. China has shown the U.S. and its allies that what matters in a maritime territorial dispute is the actual ‘possession’ of the islands, and as long as the PLA exercises military control over the features, it will exploit their location to support broader territorial claims. For New Delhi, which has been concerned about the security of its trade-flows and energy interests in the South China Sea, however, Beijing’s placement of missiles points to a sober reality? As the disputed islands are militarized, it could imperil freedom of navigation, making Beijing the main arbiter of the accepted range of ‘legitimate’ operations in the South China Sea. Second, China’s exertion of authority over areas of maritime interest is mostly through indirect means. In the immediate aftermath of the new radar installations in the Spratly’s and deployment of missiles on Woody Island, it looks increasingly likely that Beijing would impose an air defense identification zone (ADIZ) in the South China Sea, ensuring the PLA’s dominance over the surrounding air-space and seas. At present, the likelihood of Chinese aggression occurring outside the disputed maritime spaces in Southeast Asia looks remote. Yet, there is no discounting Chinese maritime assertion in other areas where Beijing might have strategic interests – including critical spaces in the Indian Ocean. Third, China’s maritime behaviour is independent of multilateral attempts to lower temperatures in the region and aimed at establishing the image of a dominant power player in the Pacific. The timing of the missile placement at Woody Island coincided with U.S. President Barack Obama’s meeting with ASEAN leaders at California, where the participants sought to evolve a consensus for a peaceful solution to the disputes in the South China Sea, and the need for common norms and rules of behaviour. Beijing’s actions, U.S. analysts point out, are in reality driven by the need to normalize the idea of Chinese military presence in contested territories. For New Delhi, recent events underscore the contested nature of maritime politics in the Pacific. China and the U.S. play the ritual of cooperation and conflict at sea with a practiced ease that is hard to overlook. The U.S. Chief of Naval Operations consultedwith his Chinese counterpart about unplanned encounters at sea. Both naval chiefs appeared satisfied with the implementation of the code. Yet, only a few days later, China had placed missiles on the Woody, and Admiral Harry Harris, the commander of U.S. Pacific Command, announced that the security situation had worsened. Lastly, the recent developments emphasize the need for India to strike a balance between maritime security imperatives in the Indian Ocean, and its legal stance on freedoms enjoyed by user states in territorial waters. New Delhi’s real dilemma is that while it opposes Chinese aggression in the South China Sea, it also disagrees with Washington’s interpretation of maritime law and the freedoms enjoyed by foreign warships in littoral spaces. In particular, India does not concur with U.S. attempts at claiming a “right to uninterrupted passage” in coastal waters without the prior permission of the subject state – especially in areas that are deemed to be within a nation’s territorial waters. New Delhi’s view on the subject, in fact, broadly corresponds with Beijing’s – particularly on the need for prior notification by foreign warships before entering a coastal state’s territorial waters or EEZ claiming innocent passage. Viewed through an Indian prism, unannounced forays through territorial waters and EEZs under the rubric of “innocent passage” or absolute “freedom of navigation” are a challenging proposition. Even though the UNCLOS permits continuous and expeditious passage – necessitated by the requirements of navigation – New Delhi does not concur with the practice of conducting maritime operations to score political points. New Delhi knows it cannot support a U.S. manoeuvre, whose logic could be used to justify greater Chinese maritime activism near the Andaman Islands. For this reason alone, it is unlikely that U.S. and India will conduct joint patrols any time in the near future, even though New Delhi broadly supports the U.S. position on the territorial disputes.